I've been thinking about making a Scratch-and-Sniff card for a few months now. The thought of if fascinates me! I first saw the idea at my fav. idea place, SplitCoastStampers.com. Then Close To My Heart came out with the Cherry-O paper pack (and coordinating stamps). A perfect combination! (haha, too bad I didn't use the paper OR stamps in this card.) The strawberries are scratch and sniff. To make smell-y cards, use unsweetened Kool-Aid powder (the small packets) and embossing powder. It's 2 parts Kool-Aid and 3 parts embossing powder. The Kool-Aid was about 1 teaspoon's worth, so I used 1 1/2 teaspoons of Close To My Heart's Clear Detail Embossing Powder. Mix them together, then just use like regular embossing powder. 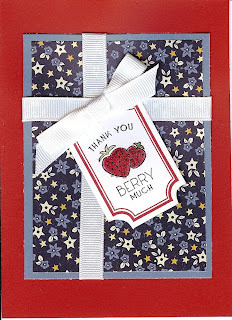 (To make my card, I colored the strawberries with the Holiday Red Marker, then used the Embossing Pen on top of that. Then I sprinkled my sweet-smelling powder. Emboss with a heat gun.) Don't overheat! Want my blog posts sent directly to your In Box? Hello! My name is Lisa Sargent, and I am a Close To My Heart consultant in Newcastle, Washington. Thanks for stopping by! --- My blog isn't too active now, since I went back to work full time, but I still teach monthly card making classes and have free crafty-time at my house in Newcastle (See tab above for details) and have an e-commerce site (www.lisasargent.closetomyheart.com) if you want to shop. --- My goal on the blog is to show you artwork, give you ideas on how to use your Close To My Heart supplies, and share with you how my art comes together. --- Making cards and scrapbooks makes at least 2 people happy - the one making them (that's me...or you!) and the recipient. I hope I can help you make someone happy today. July Stamp of the Month! Close To My Heart convention - woo hoo!